Depart through the lighter, early morning traffic Saigon after breakfast by private van to Cai Lay (about two hours). After arrival, we'll pause for tea or iced coffee as the bikes are prepped. After, mount bikes and begin riding the flat scenic roads, passing fruit orchards and expansive, emerald rice fields en route to Cai Be. After arrival in Cai Be, board local sampan (boat), drifting down the smaller branches of the Mekong River past waterfront villages and floating markets, pausing for lunch of local specialties on Binh Hoa Phuoc Island. Rise early morning to witness the beautiful sunrise over the Mekong River. 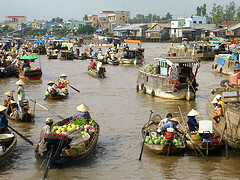 After breakfast banquet, board sampan to explore the vibrant, bustling Cai Rang and Phong Dien floating markets -- some of the last authentic floating markets in Asia swirling with hundreds of boats zig-zagging on the river. Afterward, mount bikes for pleasant riding further out from Can Tho under the lush green, jungle canopy in one of the most scenic areas of the Delta. After passing through numerous villages, return to the resort for cooling off in the pool. After breakfast, optional repeat visit to the floating markets, followed by breakfast at the resort and continued biking (or optional boating by sampan) through the tranquil paths and lush canals of the area, along the scenic, back country roads stopping to visit local schools, markets and homes. Also pausing for tropical fruit tasting and tea at a longan tree orchard with a local family. After lunch, we depart the Victoria resort and return to Saigon by private car stopping briefly in My Tho for refreshments at a popular local cafe. 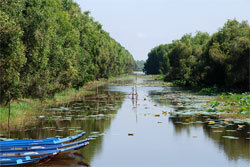 An oasis in the Mekong Delta, and even a compelling reason to make the trip at all. 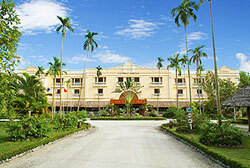 The French owned and operated Victoria is one of several properties in Vietnam and Cambodia that have been around Vietnam since the mid 90s. 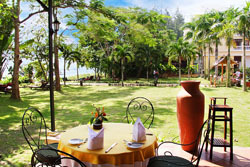 But the Victoria Can Tho is one of our long-time favorites, set overlooking the Mekong (with its own dock), a spacious pool area and lounge, and fabulous, enclosed dining hall (no mosquitoes here) where a French chef prepares a delicious and varied nightly banquet. The lobby is open and airy and there are no shortage of outdoor lounges, benches, table and tables to relax and enjoy the warm sunshine the Mekong Delta is known for. Departing for the floating markets at dawn is a simple matter, departing by boat from the Victoria's own deck. Optional activities includes cooking demonstrations, children's activities, tennis, swimming, and spa treatments. The spa offers treatments and offers some of the best massages in Vietnam, but plan to spend some of your visit for simply lazing by the Victoria's pool, a pleasant place to relax and read while sipping iced tea. On our three day trip, you can spend two nights at the resort giving you a day in between driving from and back to Saigon. This hotel is highly recommended for families and a romantic escape. 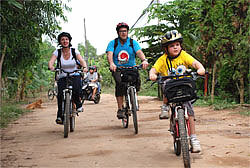 It is also our popular trip for expats based in the region, easily accessible from Bangkok, Singapore and Bangkok (read more about our Mekong biking trip on Expat Singapore). The Victoria More on Victoria Hotel Web Site. This extension onto Chau Doc will take you deeper into the more beautiful and even more interesting areas of the Mekong, and where fewer tourists travel to. After an early morning breakfast, depart Can Tho for continued cycling through the Mekong toward the border of Cambodia, along scenic country roads through rice farming villages and orchards. We'll pause en route at a fruit orchard for exotic fruit tasting and lunch of delicious regional dishes under the shade of tall palms with a local family, learning about their life in the delta, history of the area, and farming lifestyle. After photos and farewell with the family, we'll refill water bottles with iced water and remount our bicycles for more flat riding along the quieter backroads and paths that follow along the Hau River, one of the many branches the Mekong River splits into before it spills into the South China Sea. Also visit to the Khmer pagoda at Tri Ton. Looking for something really unique? 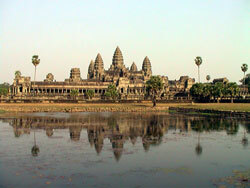 Consider crossing over to Cambodia to Phnom Penh by riverboat. This half-day cruise up the Mekong is a beautiful one and will save the long drive back to Saigon. Come see what will one day be the new Phuket. For now, the beaches on this large island are as they were in Thailand over 30 years ago -- empty. Protected from the churning South China Sea, the water is placid and white sand beaches are desolate. This tour extension will continue from Can Tho (or Chau Doc) with a short flight to the island from the delta (rather than backtracking to Saigon). Also possible to reach by speedboat ferry from Rach Gia (~3.5 hours). During certain periods, we can also arrange the shorter one-hour ferry crossing from Ha Tien. Return flight to Saigon included. Ask about accommodation options on the island. See our weather chart for best months. QUESTIONS? Call us in San Francisco at (415) 680-3788 or Email us. We are happy to answer questions or inquiries. Our 26th Year © 2019 VeloAsia. All rights reserved.